The first lesson is the longer one; it requires the viewer's disposition to recognize, beyond the usage of a common material, the profoundly original nature of each work on show at the exhibition. In other words, to recognize that the same line that here turns nearly intangible, as if it could simply renounce physicality and evaporate like a color he, can become unbreakable an withstand the wight of mountains of paper just a few meters away. Next comes the lesson on tension, which involves the meticulous task of stretching threads, one by one. In this process the work develops and gains contour, it is shaped as a body that projects shadows, takes up space, and ultimately activates the exhibition venue by challenging it. Given that these remarks apply to both installations, Edith Derdyk's Metragem is where tension is more evident. In fact, it could be no different, of the state of tension and challenge constitutes a predominant characteristic of the artist's production. This also hold true for her series created with other media such as paper sheers, iron plates, and even the printed word, as for example in her work in progress inspired in poet Haroldo de Campos' Bere'shith La Cena de Origem. Then comes the third lesson, on color: the sharp black that draws, on white paper and walls, the score of a concert for silence and the idea of a piano, as well as, principally, the diffused color yellow that positions itself in a corner of the room, stealing it and making the space infinite. The yellow whole painstakingly built line by line contains the entire universe, somewhat like the Aleph conceived by Jorge Luis Borges. 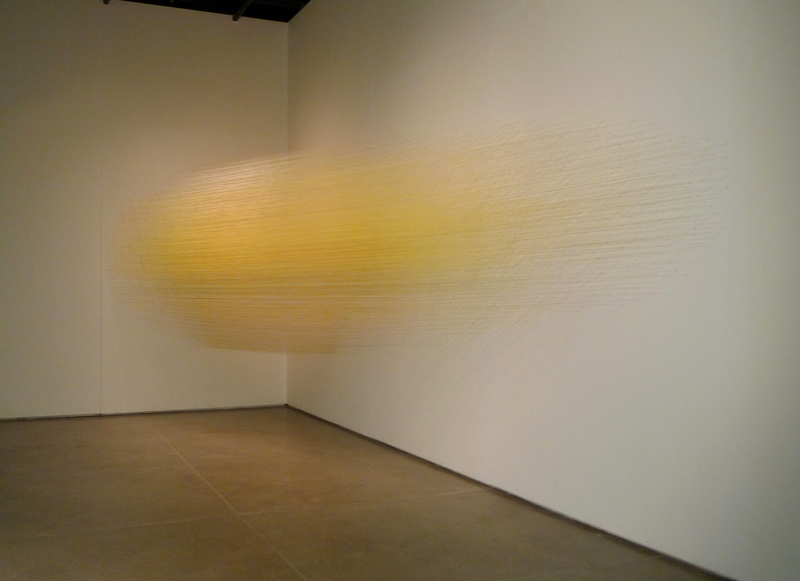 In the installation canto yellow, by Anne Lindberg, the thread manages the paradox of becoming a tridimensional line, a drawing in space, while at the same time conserving the lightness of something imaginary - the lightness of an idea. Notwithstanding its undeniable physicality and space activation capability, the line has something ethereal and intangible about it. It remains in the realm of ideas. In a way almost directly opposite to what happens in Metragem, here the drawing conceived by the artist become objects and gain tridimensionality without losing its eminently graphical character. It is as if the line made it into the world without necessarily having to subject itself to its rules and conditions. The last lesson is the most amazing of all. It consists of apprehending the sounds that silently emanates from the is, filing up the space; sending in one's body the imperceptible vibration of the expanding and reverberating line; and, finally, understanding the important of retaining what is left - namely the warmth of yellow, the vigor of black, and the wisdom of the line - and taking everything along, well preserved, out onto the district of Bom Retiro.